Due to Font limitation, we will use SurrogateFallback in registry to display all characters. But if enable “DirectWrite”, SurrogateFallback will not works. On beta 3, I added the Font Fallback list box to the Text Rendering page of the Customize dialog box. You can add “HanaMinB” to the list. This option is Enabled only on Windows 8.1 or later. 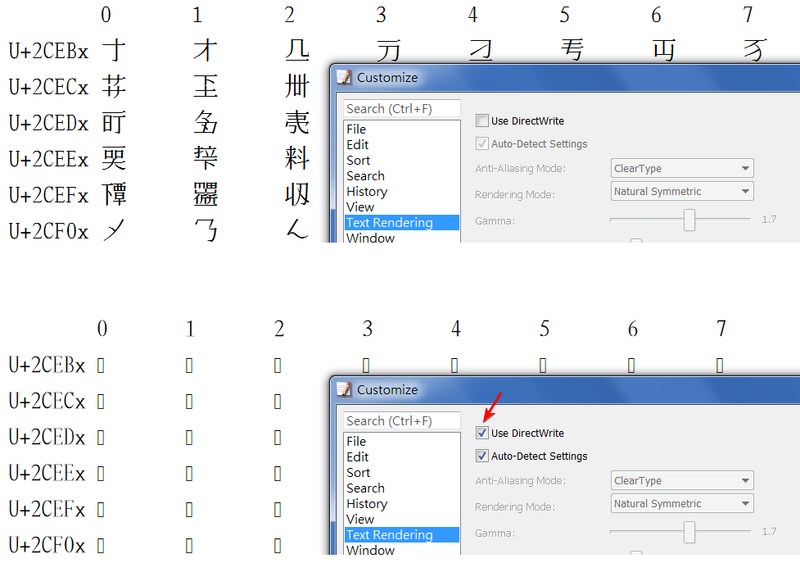 Wow…this is very useful function for editing CJK Ext. characters. Many thanks, although only English and Japanese versions are added for beta version. And is it possible to use this function when the “DirectWrite” is disable ? By the way, if try to drag and drop items to adjust the order in the Font Fallback list, it will crash. I’m glad this (font fallback) feature works for you. The next build will fix the crash and other bugs. Unfortunately, this feature works only when Direct Write is enabled.